Pozo Colorado is a beautiful place with a small village located in the East border of Salinas Grandes. 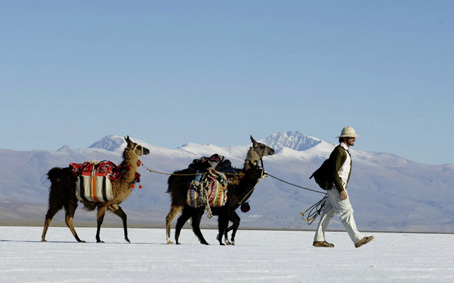 Its 200 inhabitants (native community) base their production activity mainly in extracting salt and breeding the most famous animal in our province: “the llamas”. The native community is currently working to recover its cultural heritage: spinning and weaving llama wool; carving laja stones; manufacturing salt stones crafts; and, recently, along with Caravana de Llamas, using the llama as pack animal. During the car trip towards the town of Pozo Colorado we can enjoy the spectacular landscape of “Cuesta de Lipán”, observing vicuñas and guanacos (south American wild camelids). When we arrive to Pozo Colorado we prepare the llamas for the expedition and we begin the llama trekking that lasts about and hour and a half. We penetrate the salt surface, we visit the salt extraction spots and then we have lunch. After a well-deserved rest, we return to the community to end the journey. Departure place: Pozo Colorado (the journey by car from Tilcara to Pozo takes around 2 hours). Includes: Guide from the community; full lunch with wine (regional picnic); water during the walk.